If you don’t have a workbench somewhere around your home, you should get one. You’ll never find a simpler, more economical source of mental health and household well-being. Fewer and fewer people have home workbenches these days, and maybe that’s one reason the world is crazier than it used to be. 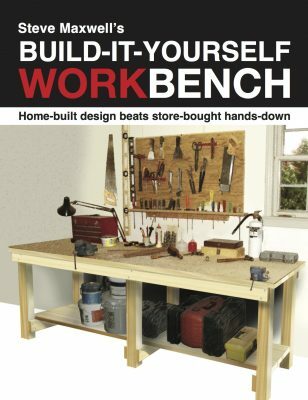 As a lifelong workbench user, let me offer four reasons workbenches are so great. I’ll even give you free building plans to help you make your own workbench happen. My design is easily modified into a sink-equipped potting bench for gardening, too. Regardless of the size or situation of your home, every household has some of the same basic needs. New items need to be assembled, old items need to be fixed or declared dead, and tools need to have a place to live. One way or the other, these functions will happen somewhere in your home. The only question is whether or not it’ll happen in some crazy, stress-inducing place like the kitchen table or livingroom floor, or whether you’ll opt for sanity and make a dedicated space for these necessary functions to happen. A workbench makes it easier and less frustrating to meet reality on your own terms, without going insane. They say that a change is as good as a rest, and healthy mental change is another thing a workbench offers. Regardless of what you do to earn your keep, come home at the end of the day, have something to eat, then spend time at the bench doing a hands-on hobby away from all things electronic. This takes more effort than twiddling your thumbs on a smartphone while getting soft and lazy on the couch, but in the end satisfaction in life is always proportional to effort. Put more in, get more out. A good workbench sometimes even becomes a place that makes you happy just standing in front of it while planning something creative. At least that’s the way for me. While it’s true that fewer and fewer household items are made to be repaired, that doesn’t mean you shouldn’t try fixing the broken things in your life. I save hundreds – sometimes even thousands – of dollars each year fixing toys, kitchen tools, bicycles, knapsacks, household items, yard tools, electronics, leather goods, appliances, footwear and lots of other things that I’d never attempt to fix if all I had to work on was a kitchen table. The internet and eBay are outstanding resources for finding out how to fix things and getting the parts you need. Today is the golden age of the fix-it-yourself lifestyle. Get a workbench and that’s the first step towards a level of self reliance our society needs to recapture. Get them young enough and every child is creative. It’s only when age and discouragement sets in that they lose the creative spark. Age, discouragement and perhaps lack of a workbench. Besides providing a place for finger painting, seeing what’s inside that broken cell phone and building their own birdhouse, bringing up kids near a workbench also gives the chance to teach lessons about organization and responsibility. None of these qualities rub off just because you have a bench, but if you keep your bench neat and insist that the kids or grandkids do the same, then you’ve done just about all you can do. The best way to get a workbench into your life is to build one. Not a handy kind of person? That idea probably comes more from habit and bad experiences than it does from the kind of person you really could become. The fact is, few people these days have had the chance to develop the confidence to try manual things, so there are lots of hidden talents out there. Perhaps all you need is a good plan. Click here to download my free workbench plans and assembly package. It includes everything you need to know to build a great bench. All I ask is a small favour. If you do download the workbench plans, please reach out and suggest that your friends and family check out this website and sign up for my Saturday morning newsletter. It’s free and I never, ever share my email list with anyone. Send them this page and they can learn more about my newsletter and sign up by clicking here.